Bynum was inaugurated as 109th Head of School on July 1, 2016. 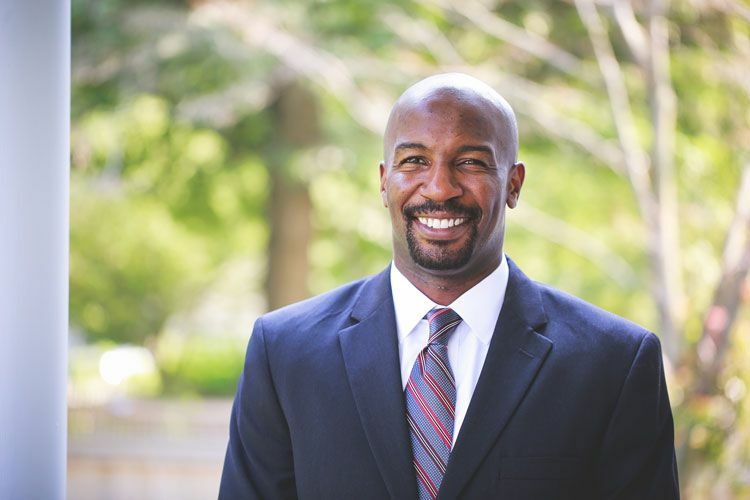 Dr. Kai Bynum is Hopkins’ 109th Head of School and joined the community on July 1, 2016, for its 356th school year. Bynum comes to Hopkins from Roxbury Latin School in Boston, Massachusetts. He grew up in Olympia, Washington, attended the University of Washington in Seattle, and then continued his graduate studies at Harvard, Columbia, and the University of Pennsylvania. In the past, he has taught literature and philosophy, and has held the role of coach and adviser. The Razor staff conducted an interview with Bynum before the new school year. What are some of the life lessons that you learned as an adolescent that help you in your current career? I learned when I was really young, maybe sixth or seventh grade, that I loved being a student and learning. It wasn’t for a grade, it wasn’t for the teacher’s recognition, it was for me. I wanted to learn as much as I could about something and not feel satisfied just with the grade, but go beyond that. I knew that I wanted to be a teacher in my sophomore year of high school, after being given a chance to work with a handful of kids in my English class. I had to read two weeks ahead of everyone else and was graded on my ability to work with the students and in my own writing. [The experience] taught me that I love teaching literature and writing, and so that is always going to be a part of my DNA. Are you planning to teach this year at Hopkins? there in some classes, either in history or English. Hopkins students are passionate about learning, but it is easy to become caught up in grades. Do you have any helpful strategies that might help students focus more on the learning and less on the grades? Focus on the learning and enjoy what you are doing, [because] if you just worry about the grade and not where you are and who you are and how you factor into the whole process, you will realize that you missed the whole point of learning. What made you choose Hopkins? The students. I already knew that the intellectual heritage of the place fit my own values [and] the kids felt supportive, invigorating, and enlivening, [so] being asked to lead a school where it will be one of my responsibilities to make sure I strengthen, not just sustain, that atmosphere, is one of the best things I could imagine, to be quite honest. Do you have any specific goals you would like to share with the student body? The most important goal is learning the kids, the faculty, and the people of the school. Without that, nothing else works. I will start with the students, though, because that is the heart of what we do. Everyone is excited to meet you! Given that that is my one goal for this year, I just hope that the kids continue to say hello, ask questions, come see me in my office. I’ll be poking around the halls and the classrooms and everything, just saying "Hi." I may be asking what you’re studying. Don’t be afraid to have a conversation and to just say hello. That’s why I’m here, so that’s the goal of all of this. Are you planning on continuing the Conversations on Race Program this year? Well if you call it an official program, no. A conversation, yes. We really have the opportunity now to leverage what we learned last year and apply it to our lives now. I’ve planned a few things surrounding the issue as we get into the school year. It’s going to be embedded into what we do, as opposed to being the single focal point that pulls away from what we do. How are you planning on uniting the high school and junior school to create more of a communal atmosphere? The division is really for organizational and operational purposes, but for us all to understand that we are a part of one school is the overriding philosophy and the overriding goal. What’s most important is connecting the kids, like the Senior Mentor Program, so I am interested in doing more things similar to that, and also working with representatives from the younger grades, too, just to get a sense of their experience right now, [to] reinforce the “one school” ideal. Work hard and be kind. Don’t be afraid to ask yourself the tough questions. Working hard is a part of character, a part of personal integrity. Being kind is empathy, [and] it’s the first step to establishing community. You can disagree and still be kind. [Also,] don’t take for granted the opportunity that you have being part of this school. So take advantage of the environment that invites you to ask questions and engage, and of people who are here to support you. This is one of the last times you are going to be able to do a lot of things, [and] those who allow themselves to explore different things in a school like this tend to get the most out of it.